My dragon was so scary on the gold, that an evil wizard decided to encase him in in wood. A valiant knight heard tale of this viscous dragon. He set off on a quest to try to slay him. First the knight had to find his way among the circular maze of the Celts. The dragon then encased himself in a wall of fire & flame. The knight, confused, warm, walking in circles, called upon the angels for help. A castle in the background will be calling for help and the success of the knights’ travels. 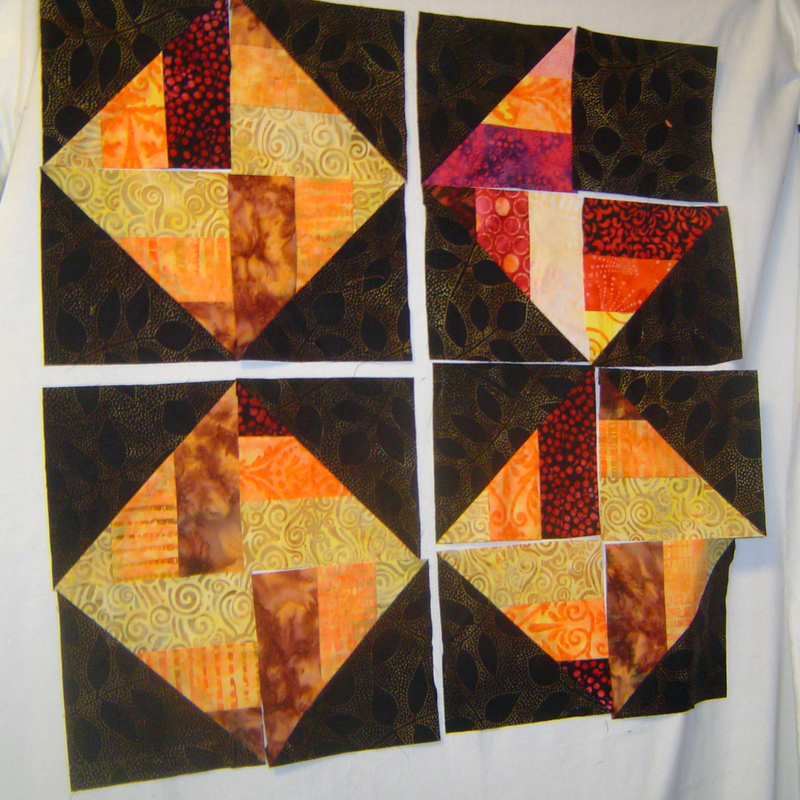 It started with ‘these blocks’ I made at the retreat in feb.
And then I made some of ‘these blocks’. (A consideration for the alternate blocks I had made last winter). And I put them together in the center. 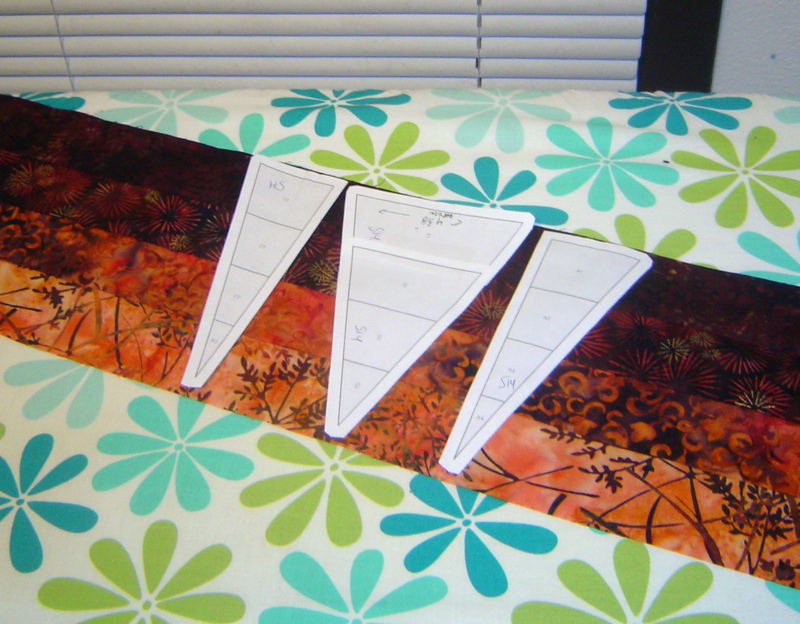 And then I found some more pieces and cut them up for some first borders. And then put away for a while. Got back out, made several more borders without pictures. 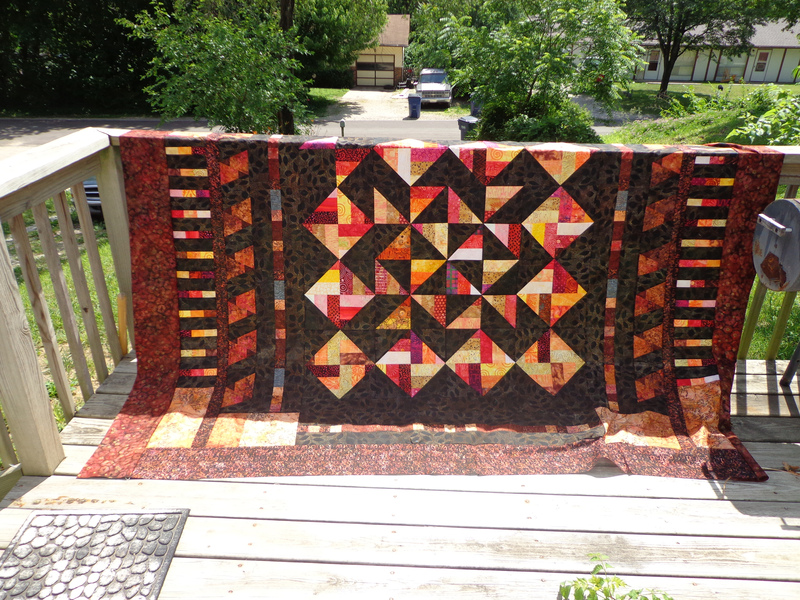 Mainly out of pieces from this quilt top. 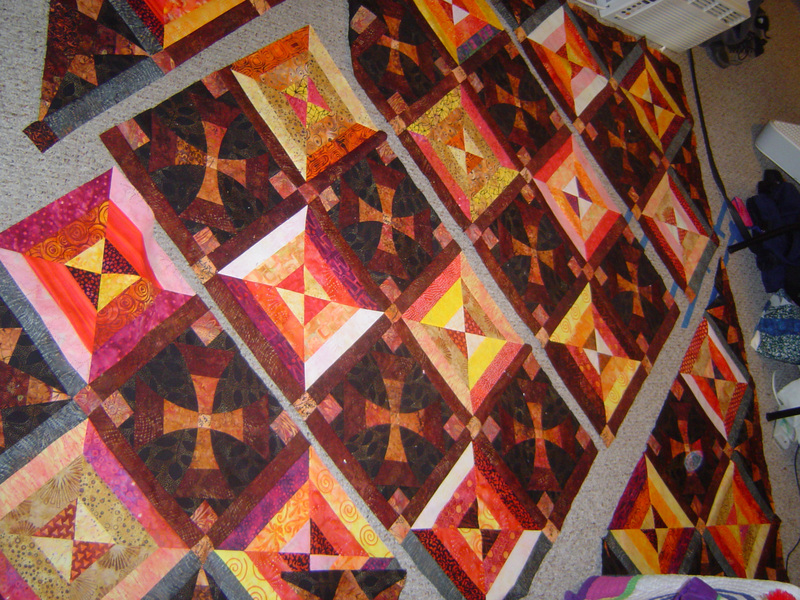 Above pieced borders were done but not attached until tuesday (of this week) morning. 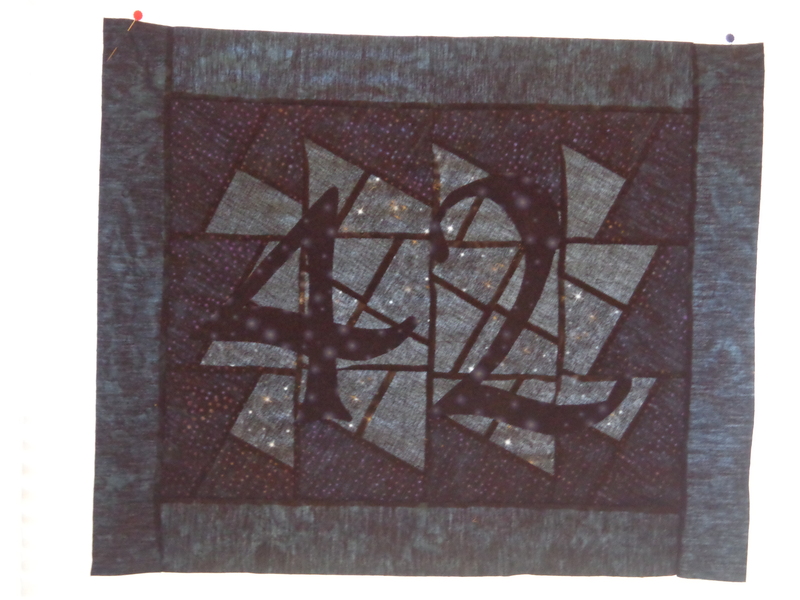 Now I am out of the black fabric used in this quilt, so anything beyond has to be from the overbuying fabric for the top of this quilt. 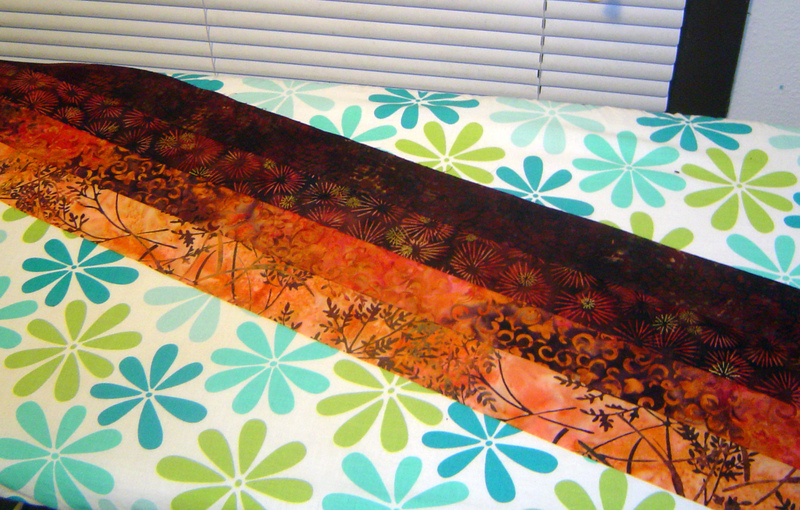 One more set of borders (already cut a while ago), but not quite the right size for the back of the quilt yet. At this point this would be a nice top in itself, but I am shy of being 4 inches larger on each side for the top of my exothermic quilt. So I’ll add more borders still. I want these last borders to be larger and less pieced in case anything gets chopped off it’s just the borders that don’t have any personality. 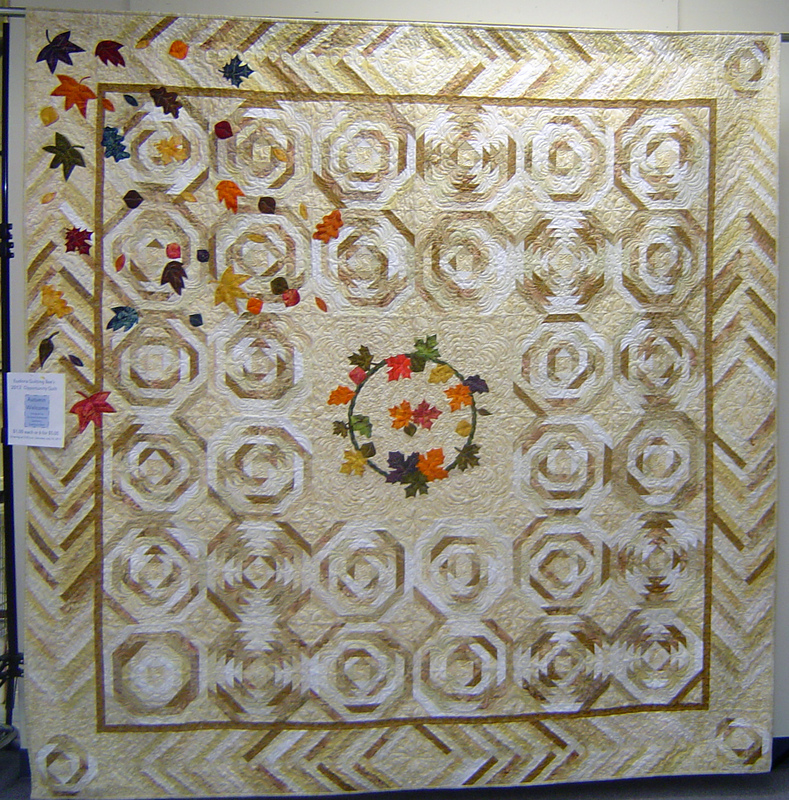 And here’s a picture of the top that this quilt backing goes with. 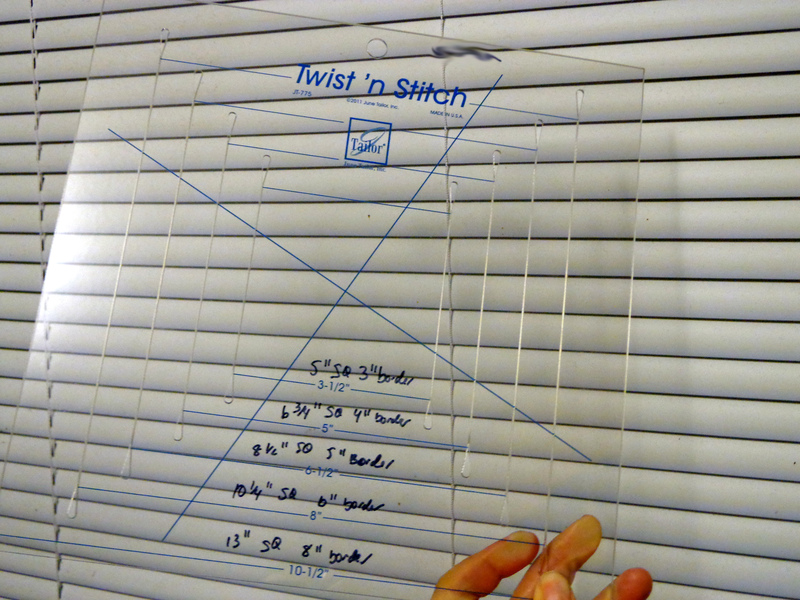 Excited to be using pieces of my stash to get this thing made. 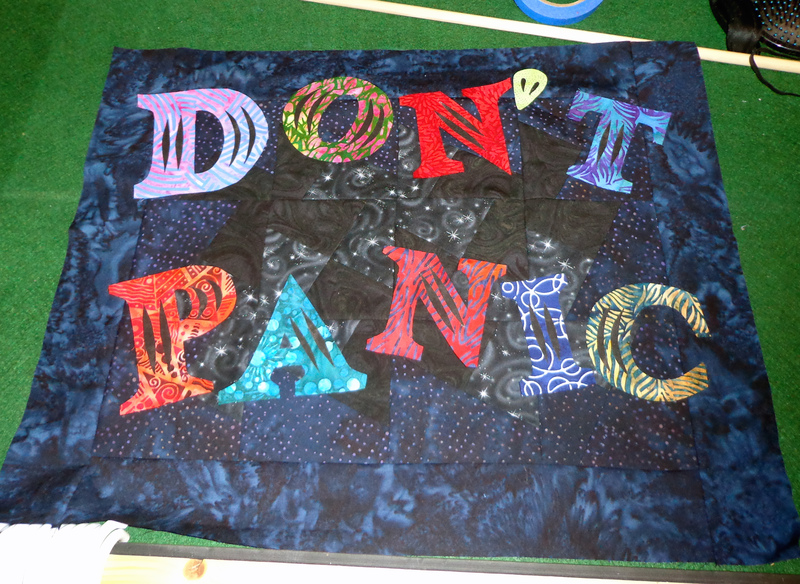 I am THIS CLOSE to being done with my quilt …. And next weekend I’ll be at a retreat that I am excited to work on something else. 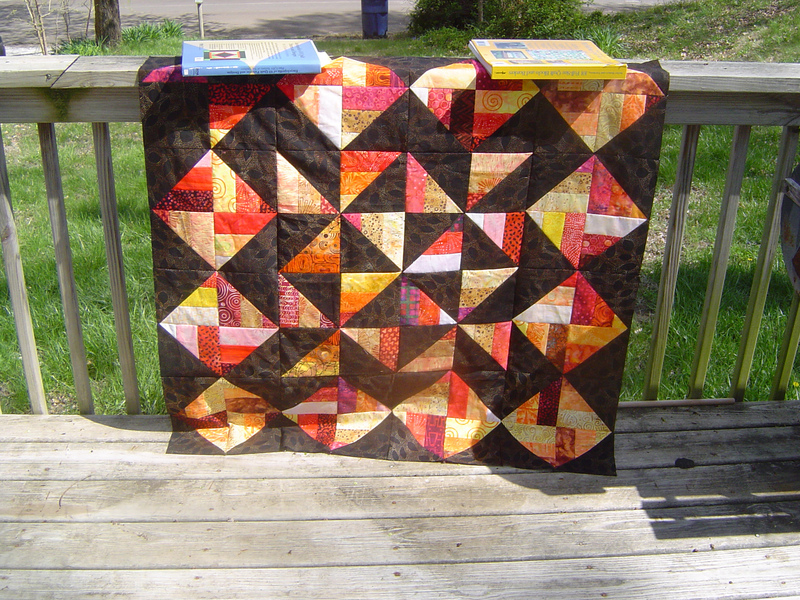 But for now lets show you what I did with the chunking on this quilt. I started with chunking before I even knew how to chunk. Last weekend (Super Bowl weekend), I took one direction, lets say the south west direction in this photo, and sewed all the sashing directly onto the blocks. Then, I took all the opposite rows of sashing, south east, and sewed them onto the corner stones. 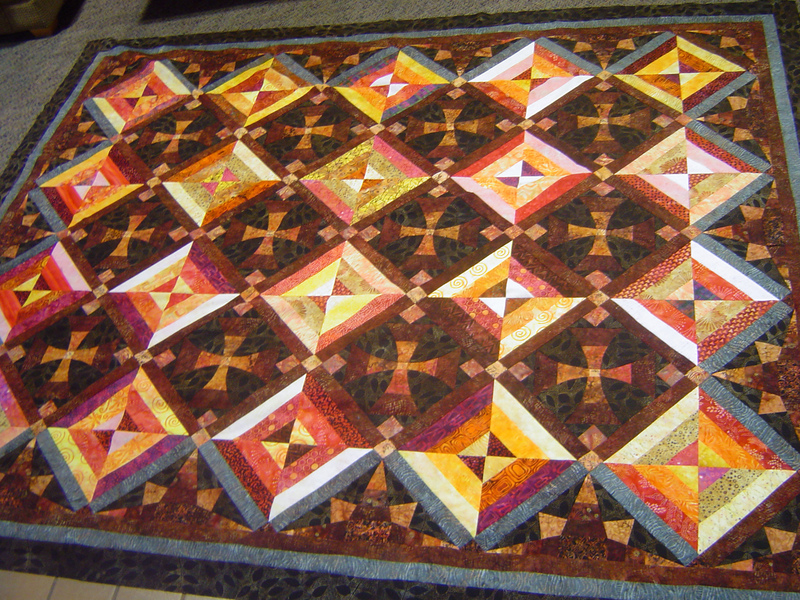 Took last weekend to do, lots of sashing & cornerstones, lots of time. 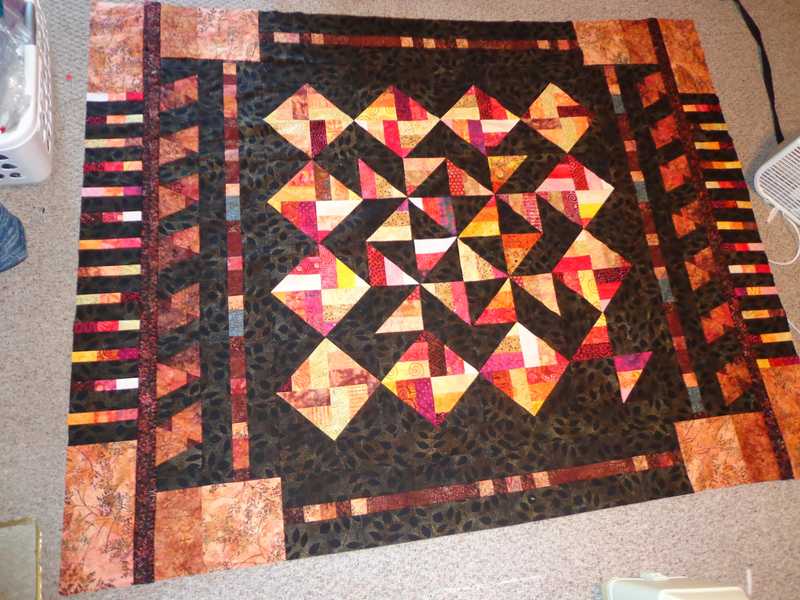 It took Saturday morning and Sunday morning to start sewing the side sashing to the block. 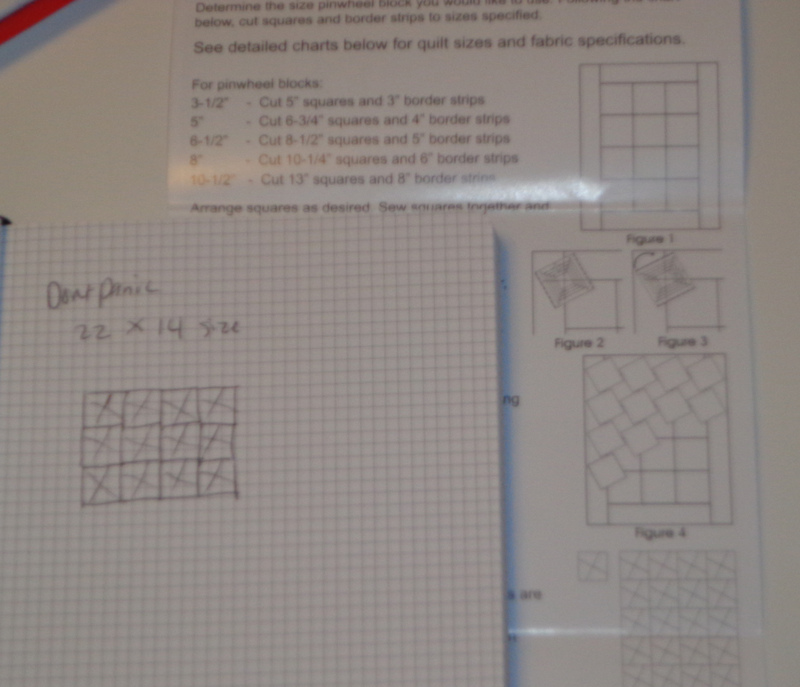 Jaye’s method of chunking involves sashing on both corners to be done first, and then, treating groups of blocks as pieces of blocks. 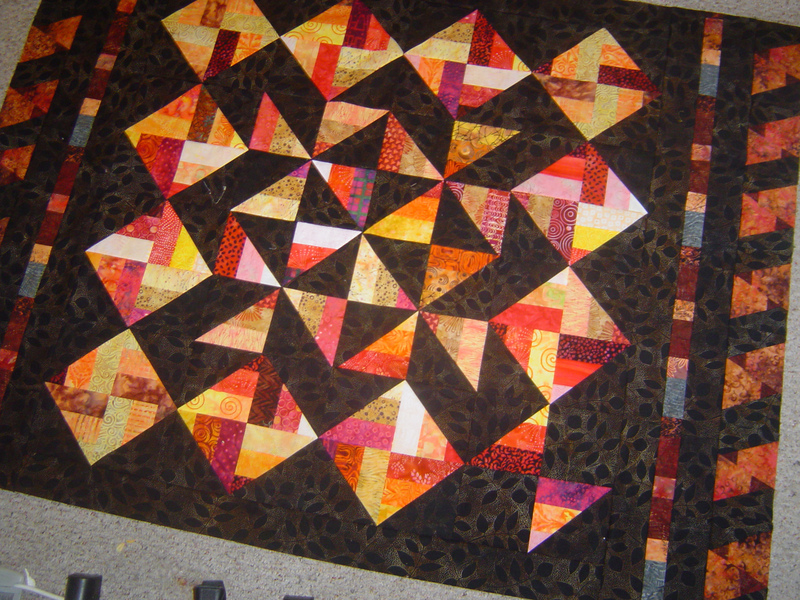 So I sewed Saturday morning, the 1st middle group together, then afterwards, noticed I flipped the light & dark pattern of my blocks, so I had to rip them out on a long car ride during the day. 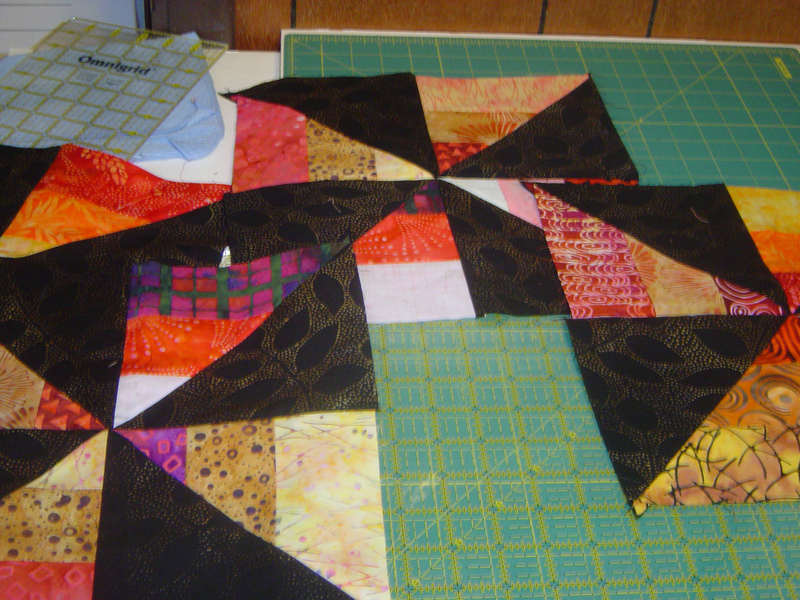 Then I resewed the block of four blocks, and sewed another group of four blocks, being careful to alternate my seams. Then two groups of four blocks became a block of 8 blocks. 2 X 4. If you can really tell I did that again. And I sewed the corners down in rows of three rows. The longest seam will actually be 5 blocks deep, which is a far cry from the 8-9(?) that are in the quilt from corner to opposite corner. Good thing is, there are only 2 seams that long, and 3 seams that are 4 blocks deep. Currently I am trying to get motivation to sew the last few seams together so I can show it off at the meeting tomorrow night. But I am getting a little sleepy. If I don’t do it now, I may not do it. I mean we have a guild meeting on valentines day. And I don’t have an extra day off wednesday to recuperate this time. Next weekend is retreat! 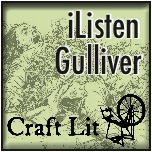 Sewing galore! Well gotta go finish, or work on finishing.